Waren Sie schon im nördlichen Mittelamerika zur Vogelbeobachtung, und wollen die Region nochmals besuchen um fehlende Arten zu sehen, oder möchten Sie so viele wie möglich der regional endemischen Arten sehen, oder andere Arten die Sie speziell interessieren? Wir beraten Sie gern über die beste Reisezeit zur Beobachtung ihrer Zielarten und entwerfen einen Reiseplan, der die Chancen maximiert, so viele wie möglich Ihrer Zielarten zu sehen. Unsere Zielarten-Touren sind private Reisen für 1-4 Beobachter, maßgeschneidert entsprechend Ihrer Zielartenliste. Diese Reisen beinhalten auch spezielle Beobachtungsgebiete, die nicht auf unserer Website vorgestellt werden. Diese Reisen bieten bessere Möglichkeiten zur Beobachtung von schwer zu sehenden Arten, wie Eulen und Ziegenmelkern, bodenbewohnende Tauben, und Wachteln. Wir freuen uns von Ihnen zu hören. "Me and four well travelled friends used CAYAYA BIRDING for a private 15-day Guatemala birding tour in December 2018 - January 2019. Our focus was regional endemics plus we wanted to visit and bird Tikal. We were more than satisfied with the tour. It exceeded our expectations. The whole arrangement was excellent with a good mix of habitats, ensuring that we ended up with a very nice trip list (386 species, of which 13 were heard only). Knut Eisermann was a splendid guide, very keen to find our targets and with excellent knowledge of all the birds occurring in Guatemala. A slightly unexpected bonus was his special interest in owls, which meant that owling was an almost nightly exercise. Our final trip list included nine species of owls and they were all seen! "We had an extremely good trip. Everything was organized with an incredible attention to detail; we saw a huge amount without feeling rushed; and the food and accommodation were far better than we had expected. Knut is an excellent guide with an incredible knowledge of the birds, wildlife and culture of his adopted home. He is also very pleasant company in the field. Very highly recommended." "I just returned from a very productive birding trip down to Guatemala with my primary focus being warblers. I had a target list and managed to find all of them thanks to the expert guiding from Knut. I let them know exactly what species I was looking for and they planned an itinerary that would give us the best chances of finding them. I would highly recommend them as they know where the birds are, get you on them and tailor the tour to whatever you want to find. Although Knut is originally from Germany he has been down in Guatemala for 20 years so knows the country very well and I always like providing business to local guides when I travel." "Knut took a friend and I in search of rare species. Even though we weren't able to reach one area due to road closures, Knut was able to quickly come up with alternate locations and great birds. He is a very personable and skilled guide that i would recommend to anyone wanting to bird Guatemala. Also he is a very safe driver." 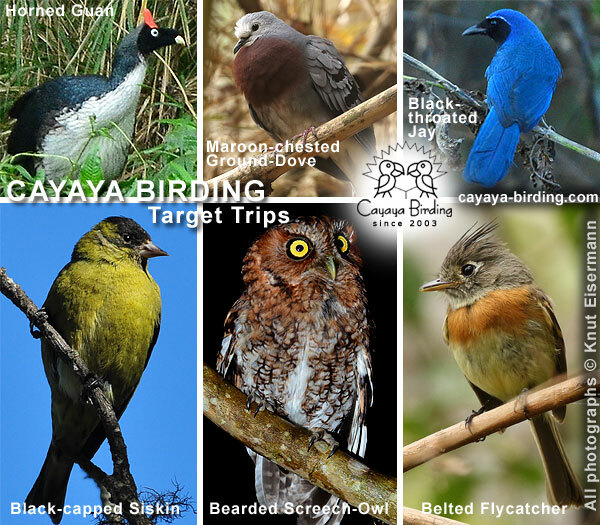 "CAYAYA BIRDING are the Guatemala experts. For expert guiding, logistics planning and knowing where the birds are, you can't beat the team of Knut and Claudia! Thanks for a great trip, guys!!" "Excellent organized birding tour with Knut as a world-class birding guide." "Knut was outstanding, friendly, kind, had unbelievable patience in finding the bird. He knew every call and song (as much as I could tell). The trip was exceptionally well organized and documented." "In May 2016 five friends and I were guided by CAYAYA BIRDING in western Guatemala and Tikal NP. This was my second birdwatching tour with Knut and Claudia (principals of CAYAYA BIRDING) and both trips were truly excellent. Knut and Claudia work together as a smooth team to ensure that everyone's needs are met -- every day of the tour. "I highly recommend Knut as a guide. His ability to spot birds I couldn't see was uncanny. They went above and beyond to get my luggage to me when it missed my flight and arrived later." My experience in Guatemala could not have been better. Knut is a very accomplished guide who knows the birds beyond field guide information. "Until recently, I'd never thought too much about birding Guatemala. Our trip with Knut has convinced to return as soon as possible and see more of this fascinating country. Experiencing the Mayan culture and the fabulous birds in the mountains is something I'll never forget. Having traveled with other birding companies, I'd have to recommend CAYAYA BIRDING over the others for personal service and effort given to show us every possible species. A truly remarkable experience." "Knut and Claudia are amazing.....we told them what we wanted to see and they planned a perfect itinerary. We saw almost all of our target birds! Can't wait to do another trip with them! " Planen Sie noch heute Ihre Zielarten-Tour!